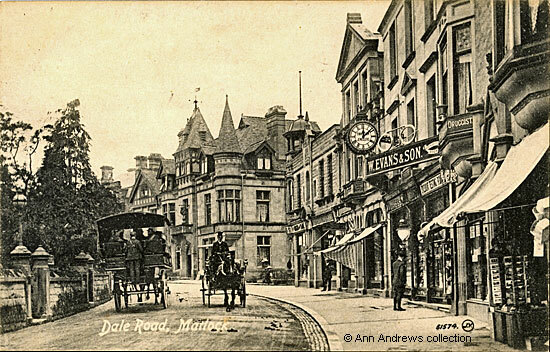 This early twentieth century postcard of Dale Road shows the Old English Hotel on the corner of Old English Road / Derwent Avenue, which had been rebuilt and repaired in the late 1880s following a major fire in 1884. Hunter's Grocery Store, with its ornate corner look out at roof level, is closer to the cameraman on the opposite corner. The photograph was taken in 1909 and the time on the clock reads 12.08. W. Evans and Sons, the jewellers, has been on Dale Road for more than a century. The founder, William Evans, had been a watchmaker in Wirksworth for several decades before moving to Matlock, with premises in the Market Place. 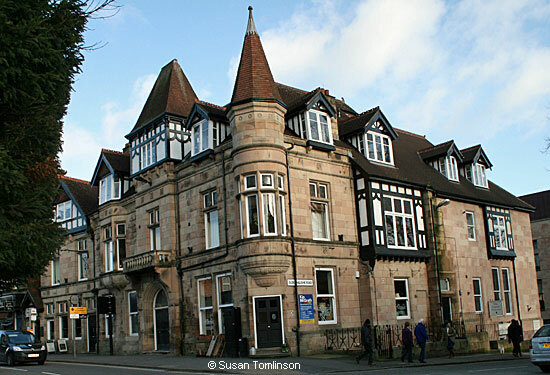 By 1891 he was living at Greenwich House in St. John's Street, Wirksworth. He was born in Nottingham and he first appeared in Matlock records about 1895. In 1899 he advertised as "William Evans & Son, watchmakers and jewellers, The Projecting clock, Dale road, & branch, Crown buildings". His son Charles Walter Evans D.B.O.A., F.S.M.C. was a certified optician. "The Projecting Clock" was used on the firm's business stationery. The spectacles above the W. Evans sign feature on several old postcards. 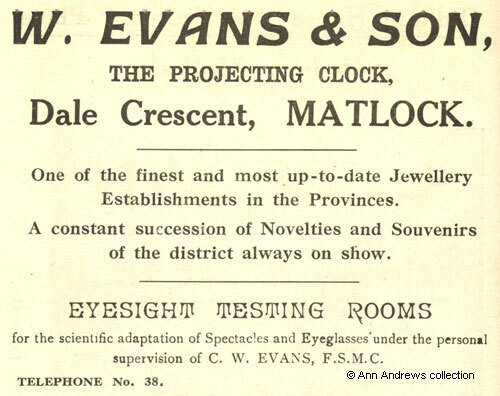 Interestingly, there were only a few opticians in Derbyshire at the end of the nineteenth century although Walter wasn't the only optician working in Matlock. From Hodgkinson's Guide, about 1917-18. To the right of Evans was the Chemist & Druggist Robert Harker and the Stationery and Fancy Goods shop closest to the camera was probably run by Eliza Harris. The former Old English Hotel, February 2016. The back of the building, fronting onto Old Englishe Road, has been extended in recent years. There is another photo, taken in the 1990s, that shows the hotel building before it was extended. of the building. 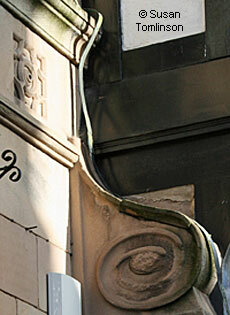 This predates the 1884 fire at the hotel. 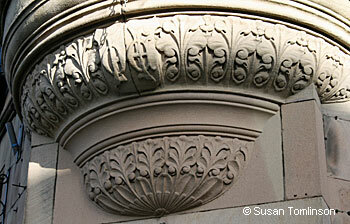 decorative scroll are show on the right. 1. "Dale Road, Matlock". Valentine's Series, 61574. Valentine's Series is a guarantee of British Manufacture. The image was registered by Valentine's in 1909. 2. Advertisement from "Guide to Matlock and Matlock Bath" (ca. 1907) Printed and published by Geo. Hodgkinson, Matlock Printing Works. No date and originally thought to be about 1907 but one of the advertisers was not in Matlock until 1917. 3, 4 and 5. 2016 photographs © Susan Tomlinson. The Old English was recently called the Cromwell Hotel, but the name has been dropped and the building changed to multiple use. "Derbyshire Courier", 15 November 1884. Destruction of the Old English Hotel. Damage £12,000. This was just one of many articles describing the hotel fire. Nothing had been done to repair and rebuild the property in September 1885 when the landlady applied to renew the license. Kelly's 1895 Directory (not listed in Matlock Bridge). An examination of several Derbyshire trades directories revealed 4 opticians in the county in 1881, by 1891 the number had increased to 9 and in both 1895 and 1899 there were 11. Many towns and villages had no-one to test people's eyes.